Many children’s TV programs claim that they can entertain adults as well as kids, but Phineas And Ferb is one of the few programs currently airing that actually achieves that elusive goal. (Gravity Falls, also from Disney, is another. And … I’m out.) This appeal is readily apparent in P&F’s latest expanded-episode event, “Mission Marvel,” the first animated crossover of Disney and Marvel characters. Sure, the melding of two separate cartoon worlds (the superhero universe of DisneyXD’s Marvel’s Avengers Assemble and Ultimate Spider-Man programs with Phineas And Ferb here) is a tad contrived, but the P&F creators have so much fun with the classic superheroes that it’s also pretty hilarious, poking fun at the hero genre it so clearly idolizes. 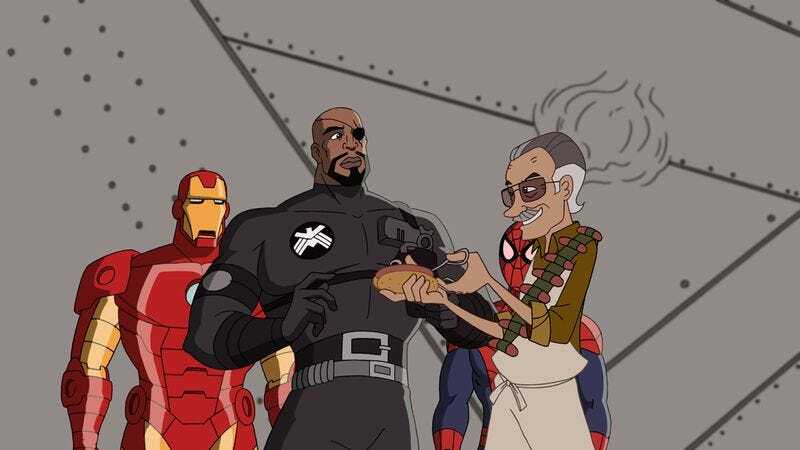 What’s really surprising is that this is the first animated crossover since Disney acquired Marvel in 2009. Although the possibilities seem endless (a romance for Hulk and Cinderella, Mickey Mouse in an Iron Man suit, etc. ), actually the Phineas And Ferb universe is a fairly seamless one for the Avengers (and Spider-Man) to step into. It already features a supervillian in Dr. Doonfenschmirtz (an ineffectual one, but still), as well as amazing inventions and adventures created by the titular siblings, who have been having the best summer ever for about six years now. S.H.I.E.L.D.’s Nick Fury (who also helps guide Spider-Man on Ultimate) tells the heroes that the damaging ray originally came from Phineas and Ferb’s hometown of Danville (fans know that this is in the Tri-State Area), so heroes and villains all congregate there. The superheroes show up on Phineas and Ferb’s doorstep to find out how to get their powers back, and the primary fun of the episode is the supers’ and villains’ weird transition from comic book world to “real” world. Hulk can’t get the little straw into his juice box. Thor’s hammer comes back to him with several parking tickets and a boot. M.O.D.O.K.’s supercomputer brain’s access to the entire Internet can be mimicked by Whiplash’s phone. (Plus, he gets free roaming.) There’s too much affection here for these bits to be billed as pure parody, but that doesn’t make it any less funny when Doofenshmirtz can’t understand Red Skull’s accent. Fortunately, the girls save the day in the end and get the heroes their powers back, so the kids all settle back to watch the heroes defeat the villains. If there’s any downside to “Mission Marvel,” it’s that several of the precious 40-some minutes here are spent on battle scenes, which we could watch on a variety of other shows. (Guessing that the Phineas And Ferb creators did not want to miss the fun of animating some of these themselves.) The most inspired battle shows the powerless heroes fighting using skateboards and bicycles, as well as a golf cart, clubs, and tees; even Doofenschmirtz’s waffle-inator makes an appearance, complete with an excellent Jimmy Cagney reference. “Mission Marvel” contains an unsubtle moral about how being a hero is what’s inside you, not what your powers are (as all the kids, and even Doofenschmirtz, rise up to battle the villains). But there’s too much fun here to get bogged down in a learning moment. Actually, if there’s a moral to this story, it’s this: Instead of worrying about Disney “kidifying” Marvel (Ultimate Spider-Man has already been on Disney XD for months, and Marvel’s Avengers Assemble started this summer), just enjoy the Phineas And Ferb magic in this animated mashup. Marvel founder Stan Lee’s obligatory cameo(s): He’s selling Excelsior! hot dogs in New York, then Danville, and also gets a narrator bit in there as well. Howard The Duck shoutout! You sure don’t hear those everyday. The newscaster announces that the supervillians have invaded the town mall, or actually: “three supervillians, a pharmacist [Doofenschmirtz], and a giant chicken egg with a face [M.O.D.O.K.]”. Is Ferb’s reference to “just a little British sci-fi technology” a Dr. Who nod? Who was that masked beaver duck?